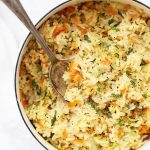 Simple Veggie Rice Pilaf – An easy side dish to kick your meal up a notch in color and flavor, this vegetable rice pilaf is easy enough for a weeknight, and nice enough for a holiday or big dinner! Post & photos updated, and video added Mar 2018. Originally posted Sep 2016. We’re still very much in the stage of trying to get Milo and Sophie to try new foods and expose them to plenty of new flavors. Veggies are, for the most part, still a real struggle most nights. 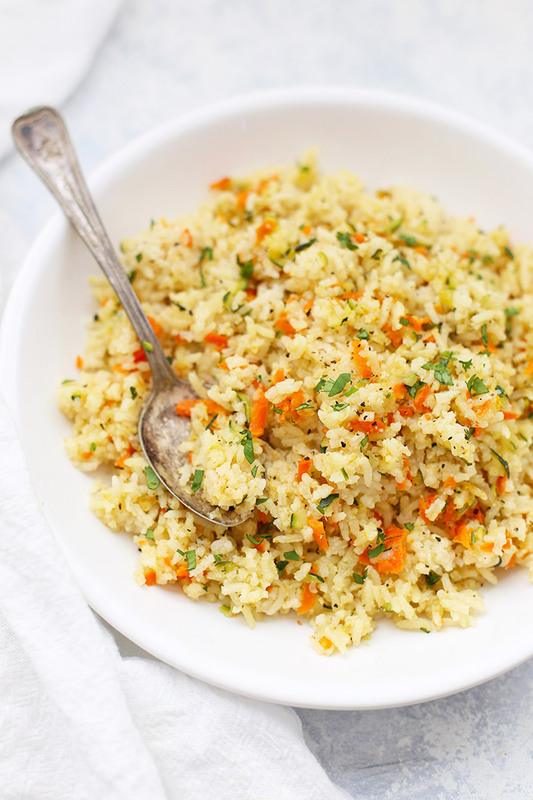 My mom made an awesome rice pilaf when I was growing up that had onion, celery, butter, and was topped with toasted almonds. I knew that my kids would push their plates away if they spotted either onion or celery, so I decided to try other veggies. 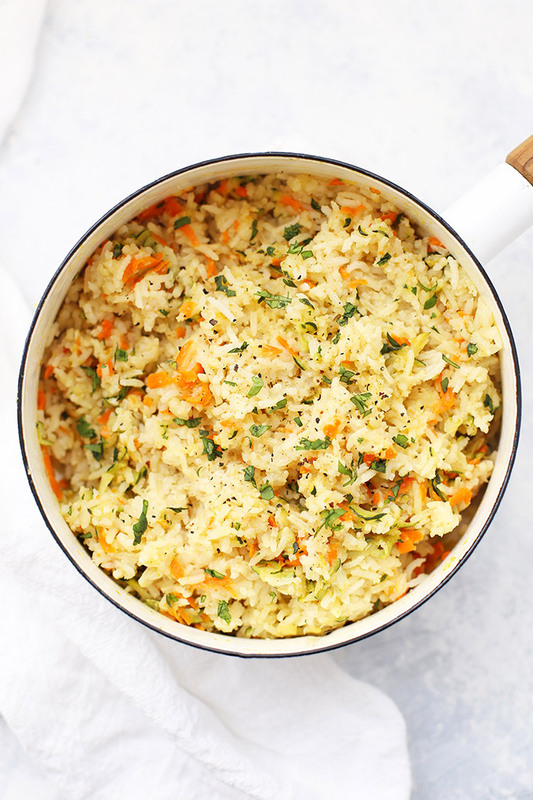 Lots of combinations work here–you can certainly add some onion or celery, a little bell pepper, etc.–but for this version, I went with shredded zucchini and carrots. 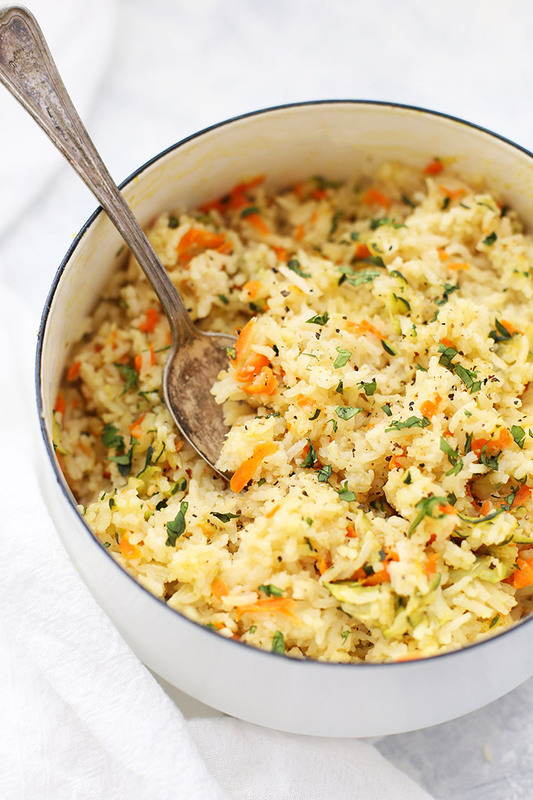 Since they’re grated, they blend right in texture-wise with the rest of the rice, and are, in all honesty, mostly there for color. The orange from the carrots gave an almost cheesy color to the rice, which actually worked to my advantage. The zucchini didn’t add more color than a tiny bit of minced cilantro would, but you can always peel the zucchini ahead of time if you’re nervous. The other big flavor booster here is the broth. Cooking the rice with broth is a sure-fire way to add an extra layer of flavor. It’s incredible what just adding a little broth can do, especially if it’s homemade. Finish things off with some fresh herbs if you like, and it’s done! 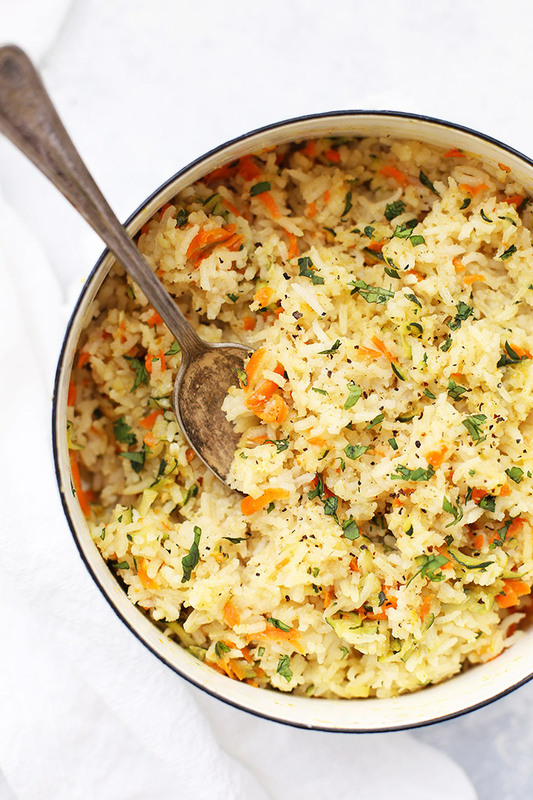 This is a perfect side dish on its own, but it’s also a great bed for stir-fry, rice bowls, and more! Let’s Talk Rice. I like to use Basmati rice most often. Lundberg is a brand that uses sustainable and responsible growing practices and tends to produce really high-quality rice. A Little Bit of Color. The veggies you add will bleed a little color into the rice. 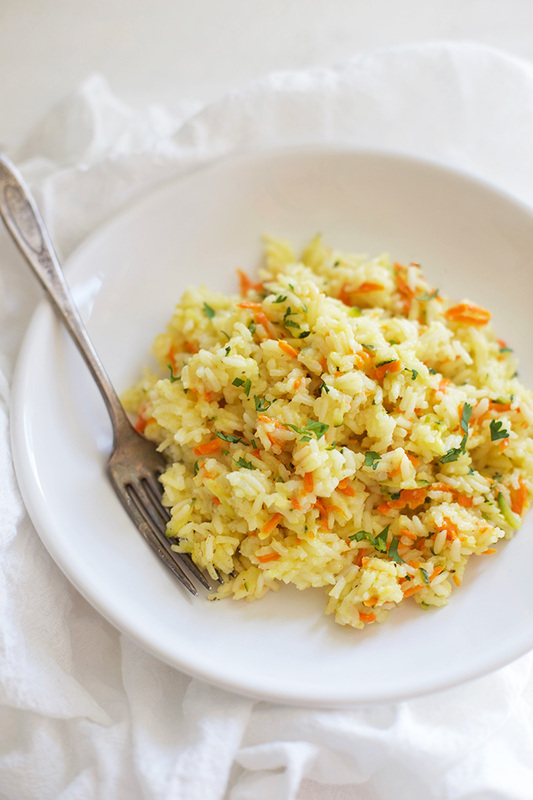 Carrots lend an almost cheesy color to the rice (which we didn’t mind one bit). Bell peppers can occasionally bleed a little color as well, so just be aware if you go that route. Try adding onion or celery in with the rice. Both onion and celery are BIG in flavor, so they’ll really add to and wake up the flavors going on. The zucchini and carrot are pretty mild, so if you’ve got super tasters on your hands, you may want to try a mild version first. Stir in some frozen peas right before serving. Mix in a flavor booster–a clove of garlic, a squeeze of lemon juice, or a pinch of curry powder or ground turmeric will add another layer of flavor. Sprinkle on some herbs. I’m a big fan of fresh herbs, and love that I can play with the flavor of this rice a lot simply by swapping my herbs. Try a little fresh dill and a tiny squeeze of lemon juice, or a little fresh parsley or cilantro. Add a bell pepper to the veggie blend and try a sprinkle of fresh basil. Rinse the rice in a fine mesh sieve to wash away some of the starch. Add your oil/butter to a saucepan and melt over medium heat. Add zucchini, carrot, and rice and stir to coat. Add broth and a pinch of salt and pepper to the saucepan and cover. Bring to a boil over medium heat, then reduce heat to low for 15 minutes or until the water has all been absorbed and the rice is tender. Fluff rice with a fork and add additional salt and pepper, as desired, along with fresh herbs (if using). 1. Try adding onion or celery in with the rice. Both onion and celery are BIG in flavor, so they’ll really add to and wake up the flavors going on. The zucchini and carrot are pretty mild, so if you’ve got super tasters on your hands, you may want to try a mild version first. 2. Stir in some frozen peas right before serving. 3. Mix in a flavor booster–a clove of garlic, a squeeze of lemon juice, or a pinch of curry powder or ground turmeric will add another layer of flavor. 4. Sprinkle on some herbs. I’m a big fan of fresh herbs, and love that I can play with the flavor of this rice a lot simply by swapping my herbs. Try a little fresh dill and a tiny squeeze of lemon juice, or a little fresh parsley or cilantro. Add a bell pepper to the veggie blend and try a sprinkle of fresh basil. This looks delicious! My littlest guy was just diagnosed with severe dairy and egg allergies, and I’ve been loving looking at all your vegan, kid friendly recipes. Thanks for sharing them! Tara – That’s so hard! Cheering for you and hoping you find LOTS of delicious options for your family to enjoy! Tara – We are in a similar boat. We have nut and egg allergies, and used to have milk allergies in our house too. It’s hard! Sending you happy vibes that you aren’t alone! I’ve found great, easily-adaptable recipes on this site. Also, for egg replacement try the “flax eggs.” It’s how I get my cookie fix 🙂 Good luck! This looks delicious! I’m going to have to try this tonight for dinner! This looks like the most delicious rice. I love carrots and zucchini. Definitely going to make this hopefully this weekend. You have so many healthy gorgeous recipes on your blog loaded with fruits and veggies. This is really nice simple food. 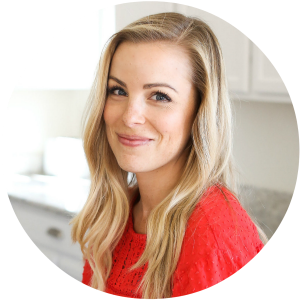 Keep doing the family friendly recipes–love this, thank you! Thank you so much Teresa! I hope you love it if you try it! Pieterina – Since I rinse it in a fine mesh sieve, I let as much water as I can drain out of the rice before putting it into the pan. I do this every time I make rice, whether it’s this veggie rice or plain rice. when do you add the rice? Looks good, making this for dinner tonight. Thank you for sharing. Hi! Just found this recipe on Pinterest and it looks great. Do you think it would work with brown rice if you added a little extra broth and adjusted the cooking time? Thanks! Elizabeth – I haven’t tried it with brown rice, but I would think so, given the adjustments you made! (longer cook time, more broth). If you try it, I’d LOVE to know how it turns out since I’m sure there are others who would love to try it that way! How will the recipe adjust if I leave out zucchini ?